Entrepreneurial Age is having a much better week overall. Not only did it top web rankings, but it settles in as one of the top 3 placers on TV based on CSM52 ratings. Nonetheless, numbers are still disappointing overall as only The Story of Zhengyang Gate breaks past 1.%. 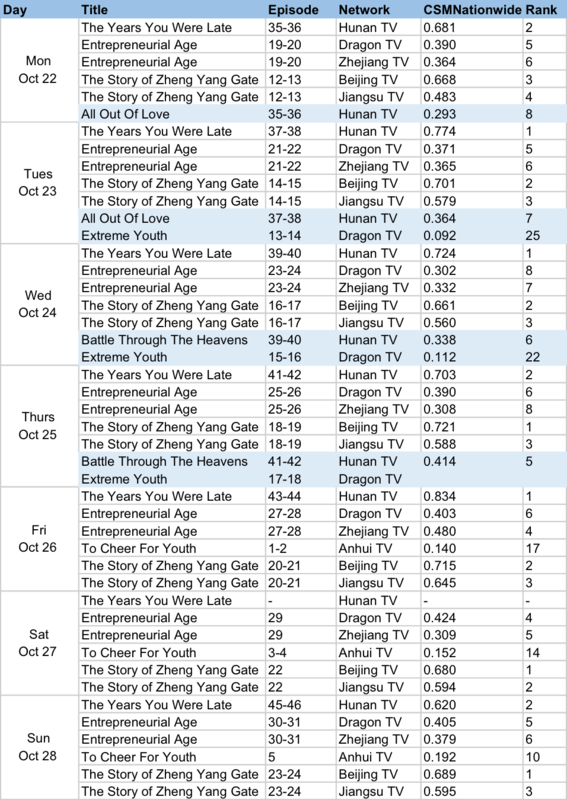 Battle Through The Heavens finale earned CSM52 ratings of 0.751% and CSM Nationwide of 0.410%. It'll be interesting to see how All Out Of Love fares now that it's taking over the slot to air from Monday to Thursday starting this week. Season 2 broadcasts like Martial Universe and The Eternal Love make a comeback to place among the top 5 dramas online. Yang Yang tops the celeb list followed by Yang Zi who has not left the list since Ashes of Love ended. Thank you! Does anyone know why Ju Jing Yi in the top 10 suddenly? I think it might be because of her new drama The Legend of the White Snake just released teasers. It actually looks pretty good. However, it's the same old same old story. I never really get the hype about this story. Also so proud of my girl Yang Zi! Still holding strong for so long. I can't believe she's still in the top 10. LOL Ju Jingyi is going to release Legend of White Snake soon. Zhao Liying is on top of her, and she havent' done anything this year besides also going releasing Our Glamourous Time soon as well. Yeah Yang Zi secured herself well ever since AOL. It comes with luck, continuously starring in bad dramas after bad dramas will not get anyone anywhere, despite how good at acting they are. There are not many good shows now a day and actors really have to fight for the good one. There are even times when they thought they were actually going to be in the best drama because the story sounded interesting, there were tons of fans reading the book, it was written by the best author, etc.....it can still turn into a big flop if not well directed in the end. Like Princess Agents and Fu Yao, both are really terrible IMO. A lot of factors come into play for a successful show, one thing goes missing and can spoil the whole tree. Oh because of her upcoming drama! I'm glad it wasn't about anything bad. Even if the drama flops like Princess Agents, from the trailer it already gave me the boring Ruyi vibe and also horrifying Dream of the Red Mansions 2010.